Mobile industrial robots quickly automate internal plant transportation, freeing up staff time and resources so human workers can focus on higher value tasks. Autonomous mobile robots safely maneuver around people and objects without any need to alter your facility. 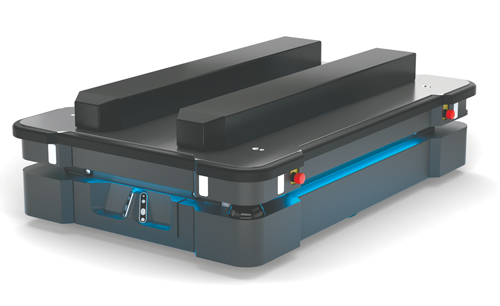 With these robots handling the logistics and internal deliveries, workflow is optimized, material bottlenecks are eliminated, and productivity is increased. These mobile robots are highly flexible, able to be redeployed for many different applications throughout the plant. Equipped with cameras and built-in sensors, the robots can recognize their environment and determine the most efficient route to take. In addition to moving easily around workers and obstacles, Bluetooth and WiFi devices can be integrated with the robots to enable them to move seamlessly through doorways or in and out of elevators. This eliminates costs needed for facility alterations, additional wires or sensors. 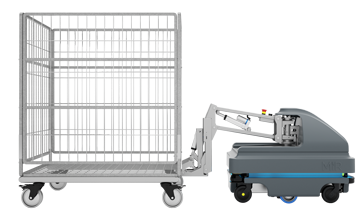 Top modules on the robots can be easily changed depending on the application at hand, and are compatible with bins, conveyors, racks or collaborative robot arms. The robots are controlled through an on-board computer, and can be set up using a smartphone, tablet, or PC. In addition to being able to carry a payload on top of the robot, the MiR 100 and MiR 200 can pull various sized carts up to 600Kg in weight. HTE Automation is dedicated to providing the resources Kansas, Missouri and Illinois manufacturers need to maximize the return on their investment in autonomous robot technology.